With individual open enrollment set to begin on November 1st and federal funding to support enrollment outreach falling, Horizon Blue Cross Blue Shield of New Jersey (Horizon BCBSNJ) today announced the grand opening of a new Horizon Connect Retail Center inside the Sanitas Medical Center in Union City. The retail center is the latest addition to Horizon’s ongoing effort to help New Jersey’s Hispanic residents obtain health insurance and access high quality, affordable health care. 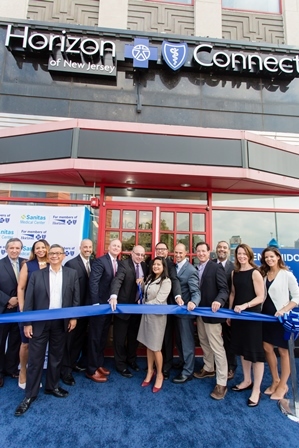 Horizon BCBSNJ and Sanitas have opened Medical Centers in Union City, Jersey City and Belleville that deliver culturally relevant preventive, urgent and follow-up care to Horizon members. “Hispanic New Jerseyans are still more likely to lack health coverage than any other group. Horizon is focused on eliminating the barriers that contribute to that and prevent people from achieving their best health,” said Michael J. Considine, Horizon BCBSNJ Vice President of Consumer, Small Group and Mid-Size Markets. “Since opening our first Sanitas Medical Center last year, thousands of residents have been helped and are able to get care in their community and from people who understand their needs. By adding a full-service Horizon Connect Retail Center to the Union City location, we’re now expanding the services to include face-to-face assistance, in Spanish and English, to help people obtain, understand, and use their health insurance. With New Jersey’s new individual mandate taking effect on January 1, the need to help every citizen obtain health insurance has never been more urgent and Horizon is increasing our outreach in response,” Considine said. Horizon Connect at Sanitas Union City is located at 3196 John F Kennedy Blvd. The retail center, which is steps away from the inside entrance to the Sanitas Medical Center, operates from 10:00 am to 3:00 pm Monday through Friday, and will offer extended and Saturday hours for the Individual Open Enrollment period. Bergen Town Center Mall - Paramus1 Bergen Town Center, Paramus, New Jersey 07652Open Monday, Wednesday, Friday: 12 pm – 4 pmSpecial Hours for Open Enrollment Monday through Saturday 11 am – 6 pm. About SanitasSanitas is a leading multinational health organization serving more than 3 million people with presence in Spain, United States, Mexico, Colombia, Venezuela, Peru, Brazil, and the Philippines. Sanitas also includes educational and socially-focused organizations that complement its world of health mission. In the United States, Sanitas has 14 medical centers in Florida, Connecticut and New Jersey, serving more than 200,000 patients in collaboration with local leading health insurance organizations. Sanitas brings a unique integrated care model that improves access to quality and culturally relevant primary care while reducing total cost of care. To learn more about Sanitas expansion in New Jersey visit mysanitas.com/nj.